What is Previcox used for? Previcox chewable tablets are used as a medication for dogs to help treat and manage the pain and inflammation that can be caused by osteoarthritis. Many dogs suffer from osteoarthritis, particularly as they age. Osteoarthritis is caused by wear and tear of the joints and can cause pain, swelling and stiffness, particularly in the knees, elbows, hips and backbone and restrict your dog’s mobility and activity and can cause lameness. Previcox chewable tablets can help relieve symptoms of osteoarthritis and improve your dog’s mobility and reduce limping and lameness. Previcox chewable tablets can also be used to help control pain and inflammation following orthopaedic and soft tissue surgery in dogs. Previcox chewable tablets contain firocoxib a non-steroidal anti-inflammatory drug (NSAID) belonging to the coxib class of drugs and has anti-inflammatory, analgesic (pain relief) and antipyretic (reduces fever) properties. NSAIDs inhibit the cyclooxygenase (COX) enzyme responsible for the production of chemicals called prostaglandins, which are mediators of a variety of cellular processes as well as pain inflammation. There are two COX enzymes, COX1 which is needed for normal cell functions and COX-2 which is involved in the inflammatory process. Firocoxib in Previcox chewable tablets is a highly selective and specific COX-2 inhibitor and this contributes to its potent anti-inflammatory activity that helps relieve the pain, swelling and stiffness in the joints caused by osteoarthritis. Previcox chewable tablets contain the active ingredient firocoxib, a non-steroidal anti-inflammatory drug (NSAID) used to treat osteoarthritis in dogs. Previcox chewable tablets contain firocoxib a non-steroidal anti-inflammatory drug (NSAID) used to treat dogs to help manage the pain and inflammation caused by osteoarthritis. Many dogs suffer from osteoarthritis, particularly as they age. Osteoarthritis is caused by wear and tear of the joints and can cause pain, swelling and stiffness, particularly in the legs, hips and backbone, which can restrict your dog’s activity and cause lameness. 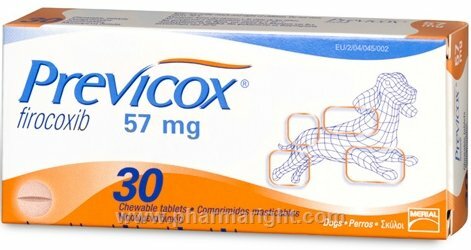 Firocoxib in Previcox chewable tablets is a highly selective and specific inhibitor of the COX-2 enzyme responsible for the production of chemicals called prostaglandins, which are mediators of inflammation. The anti-inflammatory activity of Previcox chewable tablets relieves the pain, swelling and stiffness in the joints caused by osteoarthritis. What are the side effects of Previcox? The most commonly reported side effects when using Previcox chewable tablets include: gastrointestinal problems; vomiting, diarrhoea and loss of appetite, lethargy and behavioural changes. When should Previcox not be given to your dog? has been given other NSAID medication like aspirin or carprofen, or corticosteroids like prednisone. How should Previcox be given to your dog? You should give your dog Previcox chewable tablets once a day for osteoarthritis with or without food and according to your vet’s instructions. The recommended dose is 2.27 mg/lb or 5.0 mg/kg body weight and you should see signs of improvement in your dog’s symptoms within a few days. You should continue to give Previcox chewable tablets to your dog for as long as recommended by your vet. You should give your dog Previcox chewable tablets for 3 days as needed for postoperative pain and inflammation associated with soft-tissue and orthopedic surgery. How long should you give Previcox? You should continue to give Previcox chewable tablets to your dog for as long as recommended by your vet. You should give your dog Previcox chewable tablets for 3 days as needed for postoperative pain and inflammation associated with soft-tissue and orthopedic surgery. If you miss a dose of Previcox chewable tablets give it to your dog as soon as you remember, unless it is time to give the next dose, then skip the missed dose. Do not give a double dose. How should Previcox be stored? You should store your Previcox chewable tablets below 25°C in a cool dry place and protect from light.